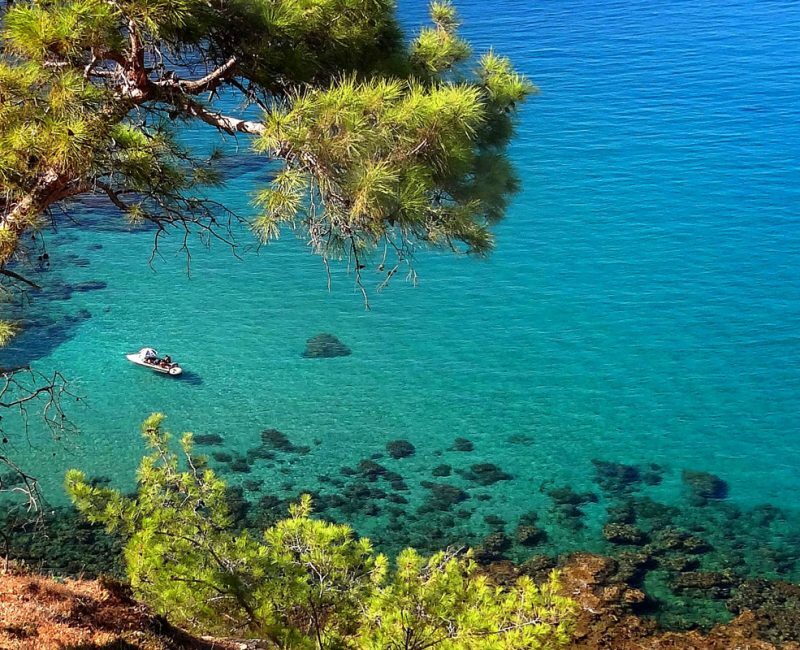 One of the destinations we offer luxury yacht charters to is the Cyprus Western Coast. Each of our trips is tailored to your needs and specific requirements. Therefore, are able to request changes to the trip programs because we strive to provide the best personalized charting experience in Cyprus! Cyprus is the third largest island in the Mediterranean sea and the home of many stunning sights and locations, perfect for cruise trips and adventures! It is located south of the Turkish mainland and surrounded by countries such as Egypt, Israel and Greece. These locations are ranked high as some of the most beautiful places to visit by a boat. Besides the great neighboring countries, Cyprus itself offers amazing charter destinations such as Larnaca, Limassol, Agia Napa and the Paphos areas. In the first day of your cruise through the Cyprus Western Coast you will visit the famous Pissouri Beach, one of the most beautiful beaches in the area. Reaching this destination takes two and a half hours of cruising at the speed of 10 knots, with the fuel consumption of 150lts. This beach features a sandy sea shore and plenty of space for walks and relaxation in the sun. One can enjoy swimming and sunbathing in this paradise, as well as take part in water sports such as waterskiing and windsurfing! Another great thing about this beach is the fact that it is less crowded than most other beaches in this area so you will have more peace and space to yourself! 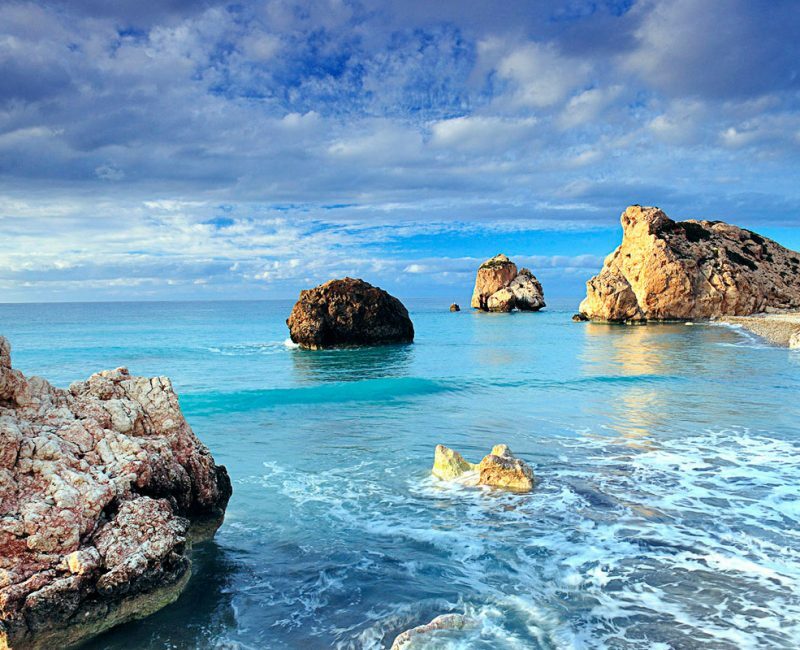 On the second day of the cruise you can visit the famous Aphrodite’s Rock on the way to Paphos. It is believed that Aphrodite was born right in this spot and legend has it if you swim three times around the rock you will be rewarded with eternal youth, beauty, fertility and luck. Even more interesting are the sea caves at the sea shore of Paphos, which you can access by a boat. You will also see the great Castle located in the Paphos Harbor! On the third day you will visit the Coral Bay, one of the most beautiful places in the Cyprus area. Coral Bay features amazing sights of shallow and clear sky-blue water. The calm waters make for a very peaceful atmosphere that turns Coral Bay into a real piece of paradise. The Coral Bay beach also has the highest rating of all beaches on the western side of Cyprus! You will get to enjoy the sun and the beautiful sights of peaceful water and surrounding resorts. One of the things you will frequently come across at the Coral Bay beach are turtle nests! Tons of turtles hatch in this area every year, making a great attraction and another reason for people to visit the beach! Last but not the least, on day four you will visit the Latchi Harbor and the municipal beach. This area features a wide variety of restaurants and resorts. Here you can enjoy a lot of different fresh fish meals and traditional dishes and get to know people from areas all over the world! Keep in mind the trip programs can be changed according to your preferences and due to weather conditions.